Today, non-invasive body contouring options are more plentiful than ever, and many have found that it can help them meet their goals for fat removal with minimal disruption to day-to-day life. But even after reviewing the basics of these procedures, it is still very easy to be overwhelmed by the variety of techniques now available. CoolSculpting® uses cold temperatures to kill fat cells with a suction and chilling device that is placed on a fatty roll, such as the abdomen or waist. The skin and fat are sucked up into an applicator that contains cold plates, one on each side, for about an hour during each treatment. You’ve probably heard of frostbite, which is a prolonged exposure of the skin to freezing temperatures which ultimately destroys the skin cells. Coolsculpting actually uses the same principle to target and eliminate fat cells, but without damaging the surrounding skin. After an hour of CoolSculpting treatment, the plates are taken away and the suction is relieved. The fat and the skin go back to their normal position, but it tends to retain a numb sensation to the skin due to the cold temperatures. Because the nerves in the skin are also affected temporarily, patients may experience numbness and discomfort for several weeks or months afterwards until sensation returns. Another well-known procedure is Zerona®, which utilizes a cold laser. “Cold” in the context of Zerona doesn’t imply freezing as will CoolSculpting, but rather it’s simply not “hot,” as is the case with some other laser-based procedures. Although this treatment does have an FDA indication for reducing fatty fullness, it’s more of a gentle, overall body fat reduction technique. Results are less dramatic and many people report seeing little or even no change. Zerona recommends undergoing six 40 minute treatments over a two-week period to achieve optimal results, which in total, is four hours of a patient’s time. Additionally, a big part of the Zerona treatment requires following dietary and lifestyle protocol, including increasing water intake and exercising everyday. Many who opt for a body sculpting procedure have already expended effort on diet and exercise, and thus would like to see more than simply nominal changes. For this reason, Zerona remains a less popular option. Another method of eliminating fat cells uses focused, pulsed ultrasound or radio-frequency energy to selectively destroy fat cells. Ultrashape, TruSculpt and LipoSonix are all similar methods in this category, however, their results and side effects vary greatly. UltraShape® delivers ultrasound energy directly into the stubborn fat below the skin’s surface, which ruptures the membranes of fat cells and leaves the surrounding skin, nerves, and blood vessels unaffected. It is described as a gentle, “comfortable” treatment with no side effects or signs of treatment. Ultrashape is usually is conducted in 45 minute treatments, and three treatments are generally recommended. TruSculpt™ delivers deep heating to fat cells via radio-frequency (RF) waves. In addition to body sculpting, it is also used for skin tightening. The TruSculpt handpiece is applied to the skin as it delivers targeted pulses of calibrated RF energy. Each pulse lasts around four minutes, and then the applicator is moved to an adjacent area. Treatment can take from 15 minutes to a full hour, depending on how many pulses are administered. During treatment, warmth and slight discomfort are typical, and minor side effects such as redness and tenderness often result but are usually resolved in a few hours. Typically one to two treatments are recommended, spaced about four to eight weeks apart. Liposonix® is described as a high-intensity, focused ultrasound treatment which is conducted in one hour treatments. The treatment applicator is placed on the target area, and high intensity ultrasound waves create a “continuous lesion” in the fat area, while the surface skin remains unharmed. During treatment, a pins-and-needles, tingling or prickling feeling usually occurs. Following treatment, the area sometimes shows evidence of significant bruising, swelling or redness, which takes time to heal. One Liposonix treatment can yield results of up to one inch reduction, considered adequate by many. SculpSure® is a laser-based, FDA-approved technology that ruptures the fat cells using a warm laser. With SculpSure, as many as four laser applicator packs can be applied to the skin by simply strapping them around the waist or abdomen. These applicator packs are 24 centimeters squared, and this surface area (times four) can be treated during one session with the current technology. It should be noted that a SculpSure treatment is complete in less than half the time of CoolSculpting — around 25 minutes, compared to nearly one hour. Similar to CoolSculpting, you can treat different areas with multiple sized and shaped applicators. 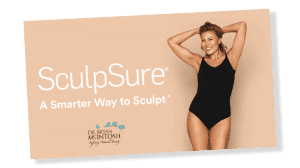 The Sculpsure applications can also be accompanied by an uncomfortable sensation — Instead of chilling the skin and freezing the fat, SculpSure treatment makes things get warm and hot, causing warm and achy discomfort. A key difference between SculpSure and CoolSculpting is that the treatment time is about half as long. SculpSure tends to be a well-tolerated procedure that does not possess the side effects of other treatment types. Pros FDA-approved procedure that freezes fat with chilled plates. Heats fat cells with laser technology. A “gentle” treatment with minimal discomfort. Uses ultrasonic or RF waves to heat and destroy fat cells. Uses a combination of laser technology and traditional surgical liposuction. FDA-approved procedure that eliminates fat cells with a warm laser. 1 hourSome experience temporary hardening, numbness of treated area. 40 minutes6 treatments recommended over a two week period. Must be accompanied with significant diet, exercise and water intake. 1 hour3 treatments recommended over a two week period. Some significant bruising, swelling and redness (LipoSonix) Invasive procedure with additional recovery time, bruising. Skin tightening effects are often temporary. Slight discomfort experienced at treatment area. Multiple treatments recommended for optimal results. Various brand-name “laser lipo” procedures, such as SonoBello or Athenix present a hybrid “minimally invasive” option, which involves liposuction plus the assistance of a laser device to remove fat. The laser device is used before and during liposuction to increase its effectiveness in targeting smaller areas. Prior to liposuction, the laser device is used to target tissue density and melt fat. Following lipo it’s used to stimulate collagen and tighten skin. The entire procedure is conducted without the use of general anesthesia; rather, local anesthesia is used to numb the area, and the patient is awake during the procedure. While it’s touted as a “minimally invasive” procedure, it often takes two to three weeks of recovery before strenuous activities like basic cardio exercise can be resumed. Furthermore, the effectiveness of the skin tightening benefits of this procedure are debated, as many factors influence the tightness of one’s skin. Often, after the actual treatment is done, or body temperature or fluid levels return to normal, the skin will return to the way that it once was. A review of the range of options demonstrates that there are some commonalities across the major non-invasive fat removal treatment types. Namely, multiple treatments are usually necessary to achieve desired results. Yet the treatment time/duration and the number of recommended treatments — and therefore the time commitment and cost of each procedure—can vary a great deal. While non-invasive fat removal foregoes the significant recovery time of surgery, varied degrees of discomfort are to be expected during and after the procedure. For instance, CoolSculpting may result in hardening and discomfort in treated areas following the procedure. There is a relationship between “risk” and “reward”; procedures offering the least discomfort tend to deliver less significant results, while procedures with more discomfort and side effects tend to yield the greatest results from a single treatment. Across the five most common non-invasive fat removal procedures, SculpSure has the shortest treatment time, least discomfort and side-effects, and shortest recovery time (none)—with end results among the best of all non-invasive techniques. Of the aforementioned procedures, it’s also the only one that you can undergo and be completely swimsuit ready the next day!